This homemade Caribbean pie will bring back memories of warm and tropical breezy days and nights. It's a combination of lime and coconut in a graham cracker crust. More homemade pie recipes at the end of the page. PREHEAT oven to 350 degrees. Put the pie plate on a baking sheet lined with parchment paper or a silicone mat. Put the cream and 1 cup of the coconut in a small saucepan and bring it to a boil over medium heat, stirring constantly. Continue to cook and stir until the cream is reduced by half and the mixture is slightly thickened. Scrape the coconut cream into a bowl and set aside while you prepare the filling. Working with a mixer, beat the egg yolks on high until thick and pale. Reduce to low and beat in the condensed milk first and then half of the lime juice. When it is incorporated, add the remaining juice, again mixing until it is blended. Spread the coconut cream in the bottom of the graham cracker crust, and pour over the lime filling. Bake the pie for 12 minutes. Transfer to a cooling rack and cool for 15 minutes, then freeze for at least 1 hour. PREHEAT the broiler. Put the egg whites and the sugar in a medium heavy-bottomed saucepan and heat over medium-low, whisking until the whites are hot to the touch. Transfer them to a large mixing bowl and beat at high until they reach room temperature and hold firm peaks. Using a spatula, fold the remaining 1/2 cup coconut into the meringue. 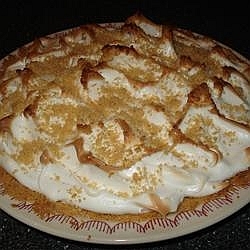 Spread the meringue over the chilled pie and run it under the broiler until the top is golden brown. You can also use a blowtorch to brown the meringue. Return the pie to the freezer for another 30 minutes or for up to 3 hours before serving. Return to the tropics when you bite into my Caribbean pie. Enjoy. I have more than this homemade pie recipe, please feel free to check out my homemade cakes below. All are homemade and most are heirloom recipes passed down over decades. Thank you.